Described as written by Madame le Marchand, "The Celebrated Parisian Fortune Teller," the book promises "An interpretation to all questions upon the different events and situations of life; but more especially relating to love, courtship, and marriage; containing a complete dictionary of dreams alphabetically arranged with a clear interpretation of each dream, and the lucky numbers that belong to them." Also contains a "Ladies' Love Oracle." 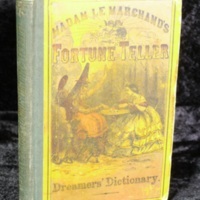 Madame le Marchand, “Madame Le Marchand's Fortune Teller and Dreamer's Dictionary,” The Skeptiseum, accessed April 25, 2019, http://www.skeptiseum.org/items/show/429.